Samotin Orthopaedics (Port Charlotte) - Book Appointment Online! 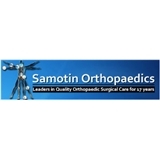 Samotin Orthopaedics was formed in 1997. The mission of our Practice is to provide the highest quality of orthopaedic surgical and non-surgical care to the residents of Naples, Punta Gorda and Orlando Florida and the surrounding communities. We strive to offer the care that our patients require in a professional, efficient and compassionate manner. Most patients find that our dedication, passion and consideration is something that is rarely found anywhere, today. We are committed to getting you back to your active lifestyle.